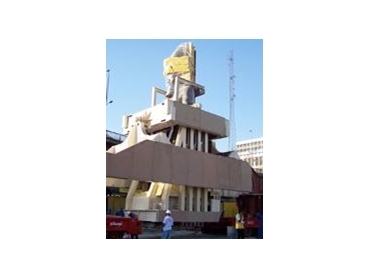 Telemac were involved in monitoring crack movement and inclination of the 11m high, 100 tonne statue of Ramses II during its relocation from the centre of Cairo to Giza last August, using the CR1000 data logger. Traffic fumes and vibrations were causing concern for archaeologists and a decision was made to move the ancient statue to a safer home. One Geocline biaxial tiltmeter and 10 FIC fissurometers were installed and monitored with a Campbell Scientific Aust CR1000 data acquisition system, providing daily reports to the local authorities during packing of the Ramses II statue. The Ramses II statue, transported standing inside an iron cage covered with rubber foam and hung on a steel pendulum-like bridge, was monitored throughout its 35km,10 hour journey by a following car transmitting sensor readings in real time through a Bluetooth link. The CR1000 data logger did not detect any variations of the cracks and the Ramses II statue is installed outside the Grand Egyptian museum overlooking the Giza plateau.